Moscow and the West may be far apart politically. But at street level, the Russian capital looks closer to Europe than ever. Among long-time visitors to Russia, there are those who recall when a Customs declaration at Moscow’s Sheremetyevo International Airport meant a bottle of whiskey for you, and one for the border cop. But not any more. Today, those bottles of stiff drink are safely stored behind glass in the international duty free shops. Saunter past those and there’s the shiny new Aeroexpress train waiting to whisk you to the city center. As political pundits debate the start of a new Cold War, Moscow seems farther from Washington or Brussels politically than it’s been in decades. But the renewed political drama underscores a distinct irony: At street level, Moscow is looking more like a Western European metropolis than at perhaps any time in its 900-year history. As the world noted the 25th anniversary of the fall of Berlin Wall this November, it might be said that no other major city has transformed more dramatically since that event than Moscow. During the original Cold War, Russia was cut off from international trends like fast food, Hollywood movies and credit cards, and many Russians lived radically different lives from those of their Western counterparts. One example: In 1987, there were only 87 licensed restaurants in all of Moscow. Today, the city is in the throes of a massive facelift as the new mayor, Sergei Sobyanin, toils to undo the worst remnants of Soviet urban planning. 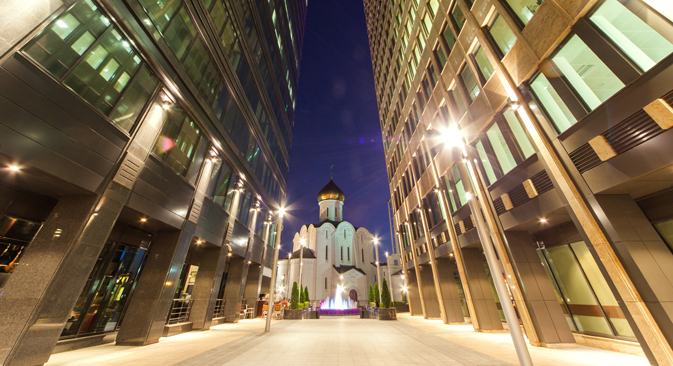 “Moscow is reborn in terms of architecture, green spaces and lighting,” says Justin Lifflander, an American who has spent 27 years in Moscow as an embassy driver, businessman and business editor for English-language daily newspaper The Moscow Times. When it was the capital of the socialist world, Russia’s most important city presented Western visitors with something of an alien landscape. For many, the first impression they got after the airport was wide streets with few cars and no advertising. Today, the city is struggling to clear mammoth traffic jams, while officials weigh measures to reduce the clutter of advertising. The changes have rendered the city center cleaner, more convenient, and – thanks to bans on the sale of alcohol in public after 11pm as well as drinking in the subway – more sober, than seemingly anyone can remember. In one marker of the change, a survey by British multinational bank HSBC recently named Russia the 17th best country in which to live for expats. Five years earlier, Russia ranked 24th out of 26 countries. Throughout the city, landmarks to the Soviet past have been torn down and replaced with modern versions. In the heart of Moscow, directly opposite the Kremlin, once stood the colossal Rossiya Hotel. Built in 1967 at a scale meant to showcase rising Soviet power, the hotel boasted 3,200 rooms and was for decades the largest in the world. Today, the Rossiya has been torn down and the location is being redesigned as an open public space by a group of companies led by the New York architecture firm that designed Manhattan’s celebrated High Line, Diller Cofidio + Renfro. Meanwhile, a small island in the center of Moscow that was once the home of the Red October chocolate factory has been gutted and revamped. Today, the island that older Russians associate with Soviet chocolates now teems with Russian hipsters scuttling between bars, cafes, photo galleries and media offices. A few miles away lies the 300-acre Gorky Park. The socialist “people’s park,” mentioned in the Scorpions’ 1990 power ballad Wind of Change, fell into disrepair after the Soviet collapse and became infamous for drug use. Now, the space has been transfigured by the design firm Wowhaus, filling the park with public art and free WiFi. Every weekend, from summer to winter, the sprawling grounds teem with Muscovites playing table tennis, taking yoga classes or playing bocce. In the aftermath of the Soviet Union’s collapse in the early 1990s, the city transformed from a grey socialist netherworld into a wheeling-dealing metropolis full of entrepreneurs reinventing capitalism by their own rules. “After the fake life of the Soviet system – big stores empty of goods, people lining up for lemons — this seemed like real life, real commerce,” says Michele Berdy, an American translator who moved to Moscow in the late 1980s. Still, as Ms. Berdy says, no matter what, Moscow is neither the grim Soviet capital nor the gangland paradise many Westerners imagine it to be.